One of the things that we love about gastronomy is travelling around the world through the different aromas and flavours of dishes. Today, we’re journeying to the Basque Country thanks to one of its most traditional dishes: albacore tuna marmitako. This Basque recipe is a true gustatory delight. Its name comes from the pot that the fishermen once used to cook the dish; that is, the marmita (pot). A metal pot with a lid which the fishermen always carried on board. Nowadays, albacore tuna marmitako is one of the most common ways of cooking this bluefish. And without further ado, let’s whip out the apron! Chop the onion, garlic and green peppers and sauté. Peel the potatoes and break into large pieces (it’s important to break them rather cut so that the potato starch can be released and the sauce to thicken). When the vegetables are sautéed, add and stir. Add the tablespoon of tomato sauce, the choricero peppers paste, cayenne pepper, paprika and white wine. Mix thoroughly and wait for the alcohol to cook off. Add the fish stock to just cover the ingredients, season to taste and bring to a boil, place a lid on top and the lower the flame to a low heat and simmer until the potatoes are cooked. When cooked, remove from heat. Add the diced albacore tuna and leave to cook with the residual heat of the broth. This is very important to prevent the albacore tuna from overcooking and becoming dry. If the broth is very clear, mash two or three potatoes with a fork and add. 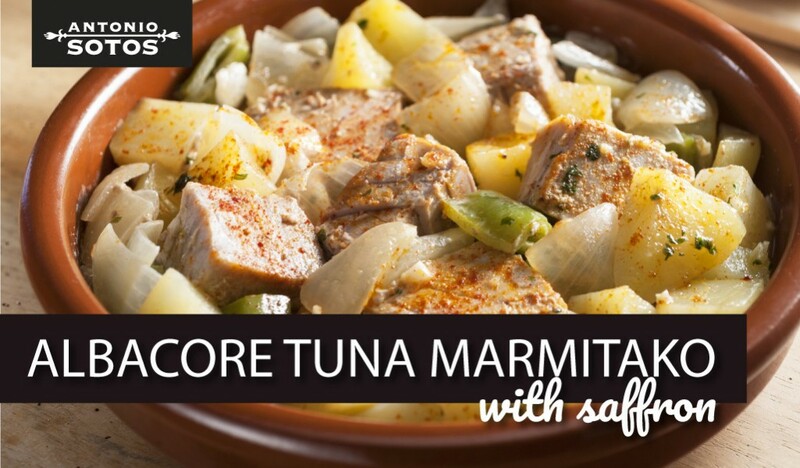 Set aside and serve this exquisite albacore tuna marmitako.